Complement has at least three roles involving neutralizing antibody and neutralization (Cooper 1987; Hirsch 1982; Cooper and Nemerow 1986, 1989): it can mediate the attachment of virus-antibody complexes to complement receptors on cells (see Sect. 8); it can enhance neutralization or bring about loss of infectivity with non-neutralizing antibody or sub-neutralizing amounts of neutralizing antibody; and it can bring about the solubilization of antigen-antibody aggregates (Miller and Nussenzweig 1975). 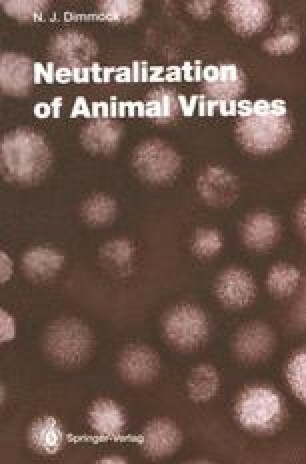 Sindbis virus, NDV and some retroviruses are neutralized by the classical pathway independently of antibody (Cooper and Nemerow 1986). C1 binds directly to viral protein, p15E in the case of retroviruses (Welsh et al. 1975; Cooper et al. 1976; Bartholomew et al. 1978). The alternative pathway can also be activated without the involvement of antibody (influenza virus, Sindbis virus, VSV and Epstein-Barr virus: Cooper and Nemerow 1986). In addition, complement is activated by virus-infected cells which may or may not require antibody as an intermediary. The classical pathway is activated by IgM and, in order of complement-activating efficiency, human lgG3, 1 and 2 or mouse lgG2a, 2b, 3 and a subclass of 1 (EY et al. 1979; Burton 1990; Valim and Lachmann 1991). Human lgG4 and IgA do not fix complement. Epitope density also influences the efficiency of complement fixation (Valim and Lachmann 1991). In the presence of specific antiviral antibodies enveloped virions are neutralized when they are permeabilized by insertion of a sufficient number of C9 pore structures, presumably allowing the entry of nucleases or intravirion ion concentrations incompatible with infectivity (avian bronchitis virus, Berry and Almeida 1968; gross leukaemia virus, Oroszlan and Gilder 1970; equine infectious anaemia virus, Radwan et al. 1973; HIV-1, Spear et al. 1990). However, Cooper and Nemerow (1989) doubt that physiological concentrations of antibody are sufficiently high for this to be common in natural infection. Alternatively, complement proteins are deposited on the surface of enveloped or non-enveloped virions and interfere with infection (Hirsch 1982; Cooper and Nemerow 1986).